A Palestinian woman and her children receive supplies from the International Committee of the Red Cross at a refugee camp in Gaza; a latrine project in Haiti financed by Oxfam; a UNICEF tent at a refugee camp in Iraq. 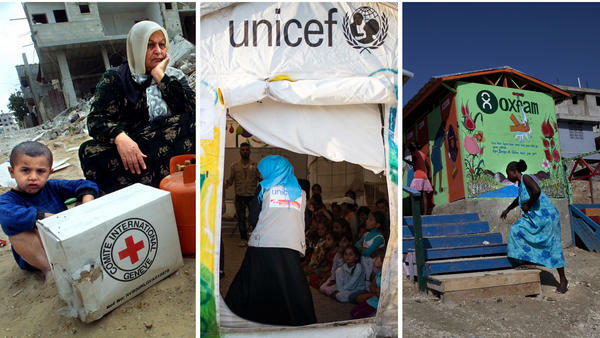 The first concern: How do the logos make aid recipients feel? Ian Birrell, an international reporter and a contributing editor to Great Britain's The Mail on Sunday, tweeted an image of a corrugated latrine door from a trip to the Bidi Bidi refugee camp in Uganda in May. Oversize signs for the U.K.'s Department for International Development and UNICEF, the U.N. children's agency, take up nearly half of the door. Birrell wrote, "So demeaning for those who fled chaos and carnage to be endlessly reminded of their supplicant status." Sudhanshu S. Singh, CEO of an India-based emergency relief group called Humanitarian Aid International, agrees. Singh recalls a time when a major relief group provided plastic water buckets for aid recipients — with its logo emblazoned on each pail in huge letters. "I think it's unfair as each time people take out the bucket to fetch water, others would immediately notice that it is part of the dole," he says. Singh doesn't want to do away with logos completely. "Some visibility is required for the sake of accountability, but it should not look like an advertisement or self-glorification, which is against the dignity of the people," he says. Big players in aid like UNICEF, for example, say that it does just that. In a statement to NPR, UNICEF spokesperson Joe English said: "As an organization, we are committed to upholding the dignity of each and every child and adult that we support." And some recipients don't mind the logos. Cedric Habiyaremye, a Rwandan Ph.D. student at Washington State University, remembers when he was living in a refugee camp in Tanzania as an 8-year-old. Each day, he would see trucks labeled "WFP" — short for World Food Programme, the U.N. food agency — come into the camp. "As kids we didn't call it 'WFP.' We called it wefpe. And we'd start singing, 'Wefpe, wefpe!' when we saw the trucks. We were full of joy, because we knew we were going to eat at that time," he says. "It was a very reassuring time of day." Habiyaremye says he used to peel the WFP labels off bottles of cooking oil to decorate his toys. "No one complained that the logos were demeaning or humiliating," he says. "I feel that I am glad I got to know who served me at the refugee camp." And that kind of connection is what aid groups want — on a global scale. Research has shown that there's a relationship between a brand's visibility — its public recognition — and donations, says Dmitry Chernobrov, a lecturer in journalism and politics at the University of Sheffield. "When agencies post these logos on toilets, schools, objects, it's very much about gaining visibility to donor audiences through the international media," he says. These logos also help ensure that charities and donors get credit for their good deeds. According to USAID's branding guide, their red, white and blue logo "was developed to ensure that the American people are visibly acknowledged for their contributions." Logos have become such a powerful tool that there have been incidents of ISIS stealing U.N. food aid, slapping their own logo on the boxes and redistributing it back to people. Governments — especially those recovering from a humanitarian crisis — are anxious to get credit, too, says W. Gyude Moore, the former Liberian minister of public works. Except there's one problem: They don't often control the purse strings. After the Ebola epidemic, foreign governments and aid groups came to Liberia to help the country finance big infrastructure projects. It was Moore's job as part of the Liberian government to negotiate these public works contracts. And signage boasting the flags and logos of project donors — the U.N., the EU, the African Development Bank, the World Bank, USAID — became commonplace. Moore recalls a particular sign off the side of a road in a rural part of Liberia: "A big, blue EU sign with the yellow stars that says, 'This maintenance was paid for by the EU and the U.K. government' — and a small Liberian flag in the corner." The signage got so out of hand that Moore would joke: "Why don't we paint the asphalt road with your country's flag, too?" There's a danger to this over-branding, says Moore. "What's the role of the state if it's unable to provide the most basic services for its people?" he says. It's the topic of a new paper he's written for the think tank Center for Global Development, where he is now a visiting fellow. He argues that in fragile states, it's in the best interests of aid groups and development agencies to let the home country get credit for big-ticket aid interventions and rebuilding efforts — even if their role was to negotiate the deal. After crises, governments and its citizens have a fractured relationship, says Moore. Citizens want to trust that their governments can handle a big shock. And governments want to ensure that they have the trust of the people. "Public goods like roads, hospitals and schools are the most significant ways the state can make its benevolent presence felt," he writes. Otherwise, it may lead to "nationwide consequences, ranging from protests to separatism." Meanwhile, concerns about safety have made some aid groups rethink the use of logos. In a conflict zone, when logos are emblazoned on products as well as T-shirts worn by staff, that could put staff at risk. Aid workers are increasingly under attack, especially in conflict zones like Syria and Yemen. "[We used to think that] if we stick [a logo on], everyone will know we're here to do good," says Paul O'Brien, vice president of policy and advocacy at Oxfam America. "But there's less and less of that notion that the branding will keep you safe. We need to get out of the branding game." Even as the debate goes on, Habiyaremye for one has no complaints. He got a chance to visit World Food Programme in Washington, D.C., in 2015 after he won a global agriculture award. He was so excited to meet some of the staff. "I'd been waiting for this moment for my entire life," he says he told them. "I just wanted to tell them thank you."